I actually didn’t know what to expect from this series coming in. It is about a young oracle in training that tries to help people with the aid of the herald that lives at her shrine. Obviously, this isn’t your standard shrine because the “oracle” is a young girl living in modern Japan. Diomedea has brought us an interesting little series. A fairly cheery story for an initial death. This looks like a story that revolves around a young girl that tries to help the people around her with the help of a spirit that lives at her shrine. The episode starts off by showing us a funeral. Saeki’s mother died and this left her as the rightful heir to the shrine. Her father married into the family and that means she holds the lineage necessary to communicate with the shrine’s herald. Gintarou uses his powers to do things such as tell fortunes and find lost things. Even those these acts may seem trivial, Saeki is constantly requesting favors like these. She believes that it is the job of the shrine to aid those that are in need. Well, one fortune telling went south as Saeki failed to give the entire message and this led to a big fight between the little lady and the old fox. After some reflection, both parties want to apologize and it is Saeki that is on the hunt. She needs to apologize and get Gintarou’s help with finding a lost cat. The two make up and the fallout created by the bad fortune worked out somehow. This appears to be a story that will revolve around Saeki and the people that she helps. We could run into more stuff, but it seems fairly plain as of now. People get into fights a lot. As far as the cast goes, we only got to really know two of the characters. Having said that, it does appear as though we will be getting some fairly important characters in the near future. That is a good thing because there needs to be more going on. Saeki is a young girl that has been entrusted with the duty of communicating with her shrine’s herald. Even though she is very close with the spirit, Saeki is part of the modern generation. She does not show the fear or respect towards Gintarou that he is accustomed to. She can be quite argumentative and request aid in very trivial matters. Even though she doesn’t always do things by the book, Saeki is doing her best and the oracle in training is definitely a good person. Gintarou is the herald of Saeki’s shrine. He is a very easy-going guy, but the fox spirit is a bit tired of aiding in trivial matters. Although he doesn’t always show it, Gintarou definitely cares about Saeki. His shrine partner left him quite a while ago, so his time at the shrine can be quite solitary. He passes the time by lounging around and he really likes oranges. We have met several other characters such as Saeki’s dad, but we are too early in to have met everyone. The opening shows us a guy and a herald that seem to be important, so be on the lookout for them. I like this series, but I need to see more. I got a Kotoura-san vibe from this series, but that may have just been the funeral opening. The girl is in fairly high spirits, but I can see things going south. That smile may be masking what I expect to be a deceptively dark plot. The preview showed a fight amongst some high school girls and anime series tend to make those overly dramatic. I don’t know if quarrels amongst girls are normally that crazy, but anime girl fights are ridiculously evil. I am a guy, so I can’t really comment on this stuff. I assume that we will get into some stuff such as the story behind Gintarou’s partner leaving him and the mother’s death. I may actually be wishing for stuff like this because it is the only way, in my mind, to avoid a bland story. A girl using a herald to help people with their problems will only work if said problems are larger than a lost cat. A herald has to start somewhere. We basically got Gintarou’s back story. He was a regular fox that was forced out of a field quite viciously. The rock that was thrown at him is the origin of the scar above his left eye. 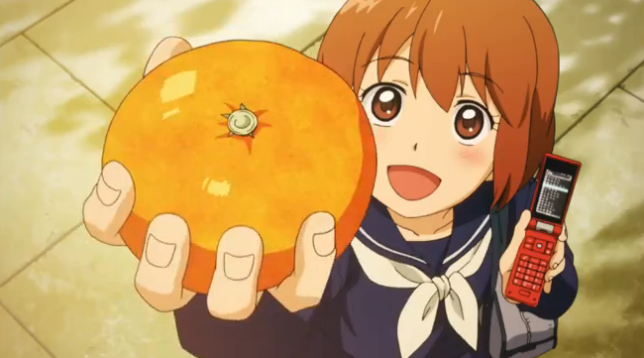 Also, we got to see the start of his orange obsession and connection to Saeki’s family. Being helped by a young woman with an orange offering was enough to start things up. I always for get that foxes are omnivorous, so the orange thing got to me at first. I don’t really know if there is much else to talk about. The episode itself gave us pieces of information that will become important, but there wasn’t much else going on here. Just some minor issues like a rocky romance and a lost cat. I am hoping for more and I better get it. I don’t think I can sit through much more of this if nothing is going to happen. I need a legitimate story or something. It seems a bit too serious for quality comedy as of now. Can’t you just look for it the regular way? The plot reminds puts me in mind vaguely of Kamichu!, which is one of the sweetest anime I’ve ever seen. I don’t expect Gingitsune to be as good (mostly because I just don’t think it possibly could be), but the first episode was okay. Like you though, I also thought the story presented itself a bit too blandly, but I’ll give it one or two more episodes to see if it picks up. Yeah, I am not sure if it will be able to live up to the standard that was set by this ridiculously good season. What type of anime is Kamichu! by the way? I am always looking for quality series to watch. Kamichu! is a 2005 light fantasy/supernatural and slice-of-life series, with a dash of romance. I found it incredibly sweet but not moe or melodramatic (both of which are definite pluses in my book). It’s only 12 episodes as well (plus 4 side-story OVAs if you want), so is easily digestible.